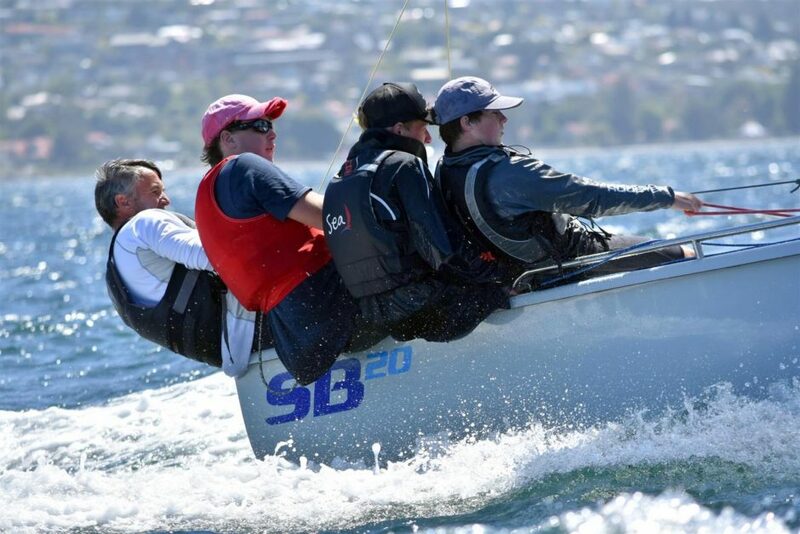 Paul Burnell, his sons Oli and Toby and Bayley Fisher, sailing Honeybadger, set the pace in the inaugural mid-winter championship on the Derwent for the high-performance SB20 sports boat class. Burnell won the first two races in light north to north-westerly winds, following these with a seventh and a fifth for a 14 point total, six points clear of his nearest rivals. 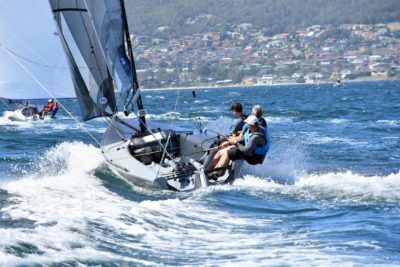 Co-incidently, the Sandy Bay Sailing Club stalwart’s success comes on the eve of the International Cadet world championship in Germany, a title Burnell won twice as a teenager. Burnell has continued as an active and successful adult sailor, his sons Oli and Toby following as talented sailors in dinghy classes and, over the past few seasons, as top crew in the family SB20. Export Roo won race four of the SB20 mid-winters today. They finished 16th overall and won one race of the 2018 SB20 Worlds sailed on the Derwent last January. Despite light winds yesterday, the Derwent Sailing Squadron completed the four races, with four more scheduled for today when fresher winds are predicted. With Honeybadger winning the first two races, the first by a mere five seconds, race three went to former champion Sharpie sailor Frazer Read in Pinch. Race four went to Michael Cooper, helming Export Roo. who finished seventh overall and second Australian boat in the 2018 worlds in Hobart and was runner-up in the 2017 worlds at Cowes, UK. Going into day two, Honeybadger is on 14 points, Pinch sharing 20 points with the Porco Rosso (Ellliott Noye). Close behind the three leading boats are Export Roo and Brainwave (Scott Brain) on 21 points, Team Musto (George Peacock) on 22 points and The Monkey Boat (Edward Fader) on 23 points. Unfortunately, racing on the Sunday was abandoned because of no wind on the Derwent. The DSS Winter Series Race was also abandoned.